This summer, it's all about berries! I managed to salvage enough of the strawberries I picked to make fresh red berry granita. 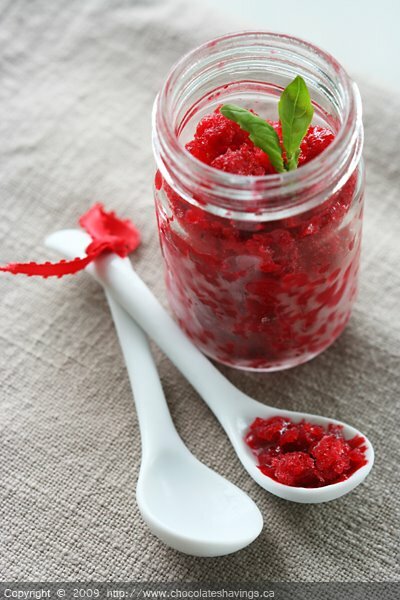 Granita is an easy way to make a frozen treat in the summertime: all you need is fresh berries, simple syrup and a good freezer! It really has a great intense berry flavor, and you can easily play around with additional flavors to complement the fruit. I love the subtle tones of the basil leaves in this particular recipe I've developed, but it's also delicious with a little sweet balsamic vinegar, or some fresh mint. I love these recipes that you can make in advance, that can be made with very little ingredients but really showcase the freshness of the produce you use. What has been your favorite dessert recipes this summer? In a small saucepan on medium heat, add the sugar and water. Once the sugar has completely dissolved, remove from the heat and let the simple syrup cool. In a blender, add the fruit, basil, lemon juice and simple syrup. Blend until just smooth. Pour the mixture in a shallow pan, cover with plastic wrap (the plastic wrap should touch the top of the berry mixture to avoid water condensation). After about an hour, scrape the mixture using a fork to form crystals. Make sure to scrape the entire mixture. Scrape again before serving, and garnish with basil leaves. Enjoy! beautiful photo. and it sounds amazing. Made with perfectly ripe strawberries this can't help but be delicious. The color in your photo is outstanding. Love the color and the presentation..nice! Wow, great photo! We have been on a non stop ice cream making and eating frenzy, I think the fresh mint chocolate chunk is my favourite these days... it may change tomorrow though! I e-mailed you the other day, let me know if you got it because my e-mail has been acting up these days. What a gorgeous and mouth watering photo! Love it! The colour is amazing and it sounds perfect for Summer! I've yet to make some berry dessert. this is pretty!! Never tried it with basil.. new and modern! Great combination of flavors here. We love to make granitas - they are so much easier than making ice cream. that looks so amazing! i love granitas. virtually identical (right down to the picture) last year and it was really good! Jude: It really doesn't take long to do though, and it's a great option if you don't have an ice cream maker at home! It is very nice blog. I mentioned it on my blog. I've been wondering what to do with my basil besides making pesto. I'm going to have to try this!